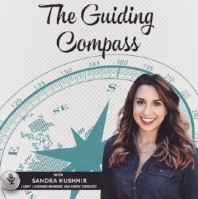 The third episode of The Guiding Compass! I meet with Jude Weber, a life coach, and eating disorder specialist. Jude has a masters degree in spirituality and incorporates spiritual practices into her work. We will be discussing the meaning of spirituality in our lives and how living authentically can truly transform your life. Jude Weber holds an M.A. in Spiritual Psychology and Consciousness, Health, and Healing, as well as a Certification as a Life Coach. Jude has committed to a life of healing, evolving in consciousness, impacting and inspiring people through our experiences. Jude began her professional career in the fashion industry, where she traveled extensively throughout the Far East and Europe on a regular basis. As a business executive, she expanded her experience into the music and financial industries. It wasn’t until 2010, when a life-threatening health condition forced Jude to stop everything, in which she truly got to examine and reclaim her life. With tremendous courage and perseverance, she has emerged with power and purpose from life-threatening illness to living in vibrant health and well being. Her commitment to deep inner-transformation allowed for growth and healing in ways she hadn't considered possible. As a result, she now passionately devotes her life to supporting Young Adults and Adults on their own recovery journey by re-visioning and creating new life after addiction. As a Transformational Life Coach, she offers opportunity for self empowerment through inquiry, mindfulness, creativity and other intentional modalities. She would love to help you discover how you can also find the blessings and healing you deserve. Jude was recently cast in the 2017 Los Angeles Live Show, “This is my Brave,” sharing her experience, strength, and hope in a piece she wrote about her journey with an Eating Disorder. She is also a winner of the 2014 Transformational Authors Experience Book writing contest (stay tuned for Jude’s Upcoming Book, Cracked Wide Open). She has also brought to life a long-lived creative dream called “Buddhaful,” a line of life affirmational Greeting Cards & Candles that inspire and nurture the human spirit through universal words and images (www.buddhaful.me).